Long Simmering Rage Leads To Rebellion In 'Chosen Country' James Pogue — a journalist with his own rebellious streak — gets at the deep-seated anger that led Ammon Bundy to mastermind the ill-fated armed occupation of the Malheur wildlife refuge in Oregon. For 40 days in the beginning of 2016, the eyes of the world were focused on the Malheur National Wildlife Refuge in Oregon, in "the remotest corner of the lower forty-eight" states. The refuge had been occupied by a ragtag group of militia members and angry ranchers, outraged by what they considered heavy-handed tactics by the federal government, at the hands of the Bureau of Land Management and U.S. Forest Service. 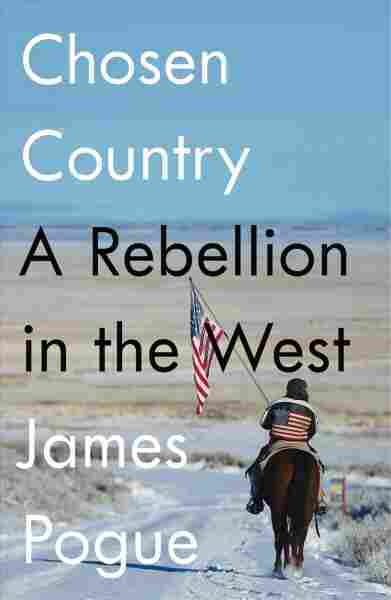 The occupiers, as James Pogue writes in his fascinating debut Chosen Country, had answered the call of Ammon Bundy, a son of notorious Nevada rancher Cliven Bundy and the mastermind of the standoff. The younger Bundy's "indescribably grandiose" plans had the goal of compelling the federal government to give up control of the land it owned in the West. This didn't happen. The only result was the shooting death of one occupier by law enforcement, several expensive trials and a worsening paranoia on the part of anti-government activists. In Chosen Country, Pogue does an exceptional job of explaining how one of the most bizarre and divisive events in recent U.S. history came to pass. Pogue, a journalist and environmentalist, spent time with the occupiers during the standoff, making unlikely friends with a few of them. His book is remarkably evenhanded, but he doesn't shy away from exploring his own history and emotional response to the events in Oregon. The movement that spawned the occupation can seem obscure to those who haven't spent much time in the West, but Pogue ably traces its origins, making it accessible to anyone who doesn't understand the deep-seated anger some ranchers feel toward the BLM and U.S. Forest Service. The agencies didn't always have a mandate to protect the public lands that many ranchers use to graze cattle. In 1976, after passage of the Federal Land Policy and Management Act, which ended the practice of homesteading, the BLM was empowered to enforce environmental regulations, in some cases drastically limiting ranchers' access to the lands. This produced a "pure and hot kind of rage," Pogue writes, "the kind that derives from a sense of betrayal." Pogue turns out to be uniquely qualified to explain how discontent in the West led to a series of breakdowns that have broken our country, and are far from over. And while at times he's certainly sympathetic to the attitudes of the occupiers, he doesn't treat them with kid gloves — he can't understand their willingness to tear apart families by sacrificing themselves, or their associations with militia members with cruel, Islamophobic streaks. "They have a teenage boy's conception of freedom," he writes, "an idea that responsibility to the future and to the needs of the broad community is a mean infringement on their rights, not a way to ensure that all of us have the freedom to make a life as best we can." As a lover of the West with a rebellious nature of his own, Pogue turns out to be uniquely qualified to explain how discontent in the West led to a series of breakdowns that have broken our country, and are far from over. The country hasn't heard the last of the Bundys — Cliven's son Ryan is currently running for Nevada governor — and the issues that caused the Malheur occupation simmer to this day. "The Bundy men experience personal misfortune as evidence that something is wrong with the world around them," Pogue writes. "And rather than change themselves, they set out to change what was wrong with that world."